One day I turned and felt something pop in my back, then I felt a rubber band effect from my left shoulder all the way around into my groin area. It was difficult to move, stand or walk. These problems affected my everyday life and I couldnt work or function at all. I went to a pain clinic and all they did was prescribe pain pills and not exam or x-rays. I went to see Dr. Gonyo who did a through exam and x-rays and found the root of my problem. After several treatments I am able to work exercise and go about my daily activities like normal with no more pain. If anything happens I go to Dr. Gonyo first to see if he can help and usually he fixes me up. In 2007 I lifted and turned slightly and felt my knees buckle. I couldnt move. I had to leave work because I could barley move. I went to a pain management doctor who gave me injections in my back and it lead to a bladder problem. I then went to a urologist and for physical therapy and not relief. I decided to go to Dr. Gonyo to see if acupuncture could help my problem. I started treatment and I felt relief within a few visits. I also received chiropractic treatment it has helped restore me back to be able to do the activities I couldnt do before. If it wasnt for Dr. Gonyo I wouldnt be as well as I am today! He truly helped me! I was suffering from an assortment of pain and discomfort: sore shoulder, upper and lower back pain, numbness in right leg. These symptoms had an adverse effect on my main hobby-tennis. Dr. Gonyo was able to get me back to my prior level of fitness and comfort with an effective combination of chiropractic and acupuncture. Dr. Gonyos care has helped me to enjoy my activities on the tennis court again to the fullest. This has had a most positive effect on my daily life. I was in severe pain-getting worse everyday. This went on too long. Finally someone recommended Dr. Gonyo for this condition. He started working with me immediately and after following his recommendations I have finally received relief. I used to hate to get out of bed in the morning. It was so much less painful to lie in bed. Now-I get up and get it done!!! I had terrific pain in my sciatic nerve. I went to medical doctors who gave me a cortisone shot, but it only lasted a couple of weeks and didnt seem to help. I was referred to Dr. Gonyo from a WellMed doctor. I started a treatment program specially designed for me and within a very short time my pain subsided and no more pain to speak of and I dont walk with a limp anymore. I feel much better and can walk better without pain. I had overall aches and pains, mood swings, menopausal stress accompanied by lack of sleep, and overall stress and restless legs. After starting treatment with Dr. Gonyo my stress was reduced and I started sleeping through the night. I had less night sweats and my legs were feeling better so I stopped the medication that I was on. My overall health has improved and my stress is relieved. Because of my experience I have referred many friends and family members. I was driving by Dr. Gonyos office one day and decided to pop in never having been there before. I had back pains, also my hips would ache and I had to go to the bathroom a lot. I would come home crying a lot because of the pain. Dr. Gonyo examined and x-rayed me and found out what my underlying problem was. He said he could help. He recommended a specific treatment for me and I followed his recommendation fully. 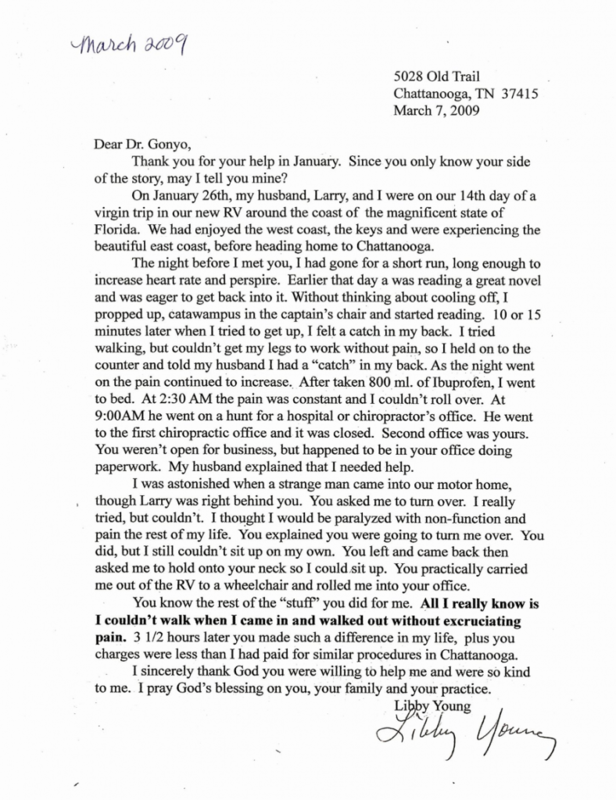 Because of Dr.Gonyo expertise I have no more pain and I can do all of the things I couldnt do before. I am also sleeping better at night. I have brought my son in for wellness care treatment for prevention of future ailments. I had severe sciatic pain. It limited me in a lot of activities like walking and going to the gym. After consulting with Dr. Gonyo he recommended Spinal Decompression, and a few other techniques to help relieve the problem. I started a treatment program with him and felt the symptoms being relieved then they were fully gone. I had been in pain for almost a year before coming in. I have been to other doctors for relief of this condition, but on help was found. I have been able to function much more easily than before the treatment. I would recommend this treatment to anyone who suffers from sciatica. Before coming to Dr. Gonyo I had partial loss of range of motion in my left shoulder and right Achilles tendon pain. I was unable to do strength required motion with left shoulder. Later on I was unable to run on toes and walk without pain. Now after being treated by Dr. Gonyo I have full range of motion in left shoulder and I can walk and run without pain in the right lower leg.